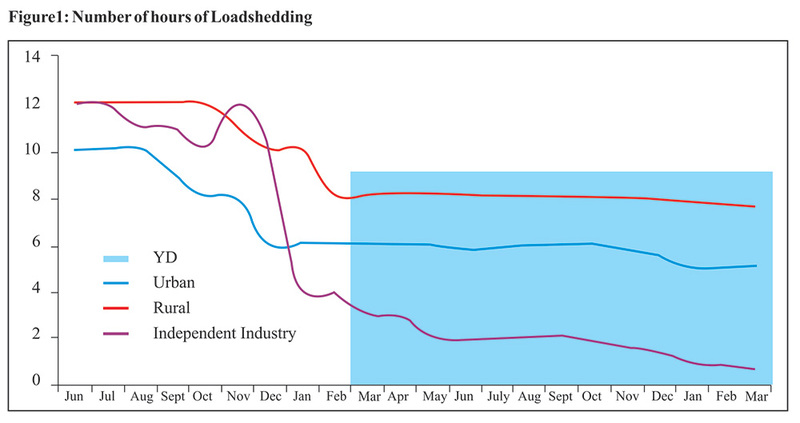 February 07: Facing more than eight hours of load shedding on average, the rural consumer was seen to have suffered the most from the country’s energy crisis in 2015-2016. 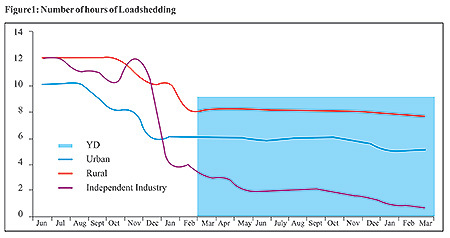 As a result of the Government’s focus on the revival of the economy, private industry only saw about one to three hours of load shedding on average while the urban consumer still faced about six hours of load shedding on average, analyses PILDAT’s Report on the Performance of the Ministry of Water and Power (MoWP) during third year of the current Federal Government. Following the introduction of the National Power Policy 2013, the Federal Government through the MoWP has been attempting to address the challenge of providing affordable, reliable, sustainable, and secure energy with relief from daily blackouts. Three years later, some progress has been made but the short-term goals have seen mixed results. These include addressing the gap in the demand for energy through focusing on increasing power generation and decreasing the cost of generating power. As part of its plan to enhance the installed generation capacity of electricity by 1,027 MW during 2015-2016, the Federal Government only added a total of 402.66 MW. Pakistan has also suffered from a high cost of generation due to the dependence on crude oil based thermal power plants which formed 66% of all power generated in 2014-2015. However, despite crude oil prices having fallen in the past two-year period, power subsidies remained high. The privatization of generation and distribution companies was one of the cornerstones of the National Power Policy 2013. In 2015-2016 the Federal Government announced and then backtracked on plans to privatize three Distribution Companies (DISCOs) amid political opposition. Instead, Initial Public Offerings (IPOs) for a minority share in ownership of DISCOs are being offered to the private sector. A key recurring factor that has impeded progress in tackling the electricity crisis has been the issue of ‘circular debt’. The issue is primarily of a cash flow problem that leads to operational inefficiencies and liquidity constraints as it cascades down to other components of the payment chain. Using figures from the IMF, the stock of payment arrears has increased from Rs. 313 billion in June 2015 to Rs. 321 billion in June 2016. The power sector because of low oil prices has been able to keep the arrears under manageable levels, which helped the independent power producers to keep afloat. The PILDAT report however noted positive progress in the management of power losses through the national grid and systematic theft. Through the use of capital expenditures to strengthen infrastructure, and revenue-based management, the MoWP was able to reduce transmission and distribution losses by 0.8 percentage points to 17.9% in 2015-16 from 18.7% in 2014-2015. This was also accompanied by improvement of the ratio of bills issued versus bills collected in 2015-2016 to 94.6% compared to 83.2% in 2014-2015, attributed to the introduction of billing systems through mobile meter reading introduced by the DISCOs in 2015. PILDAT in its report observed that sustained solutions to tackle the energy crisis in Pakistan would need more than just low international oil prices. Structural reforms, simultaneous investment in transmission and distribution infrastructure, measures to improve governance and instituting transparency in metering systems will have to be adopted. Assessment of Performance of Ministry of Water and Power Third Year of the Federal Government, June 5, 2015- June 4, 2016.